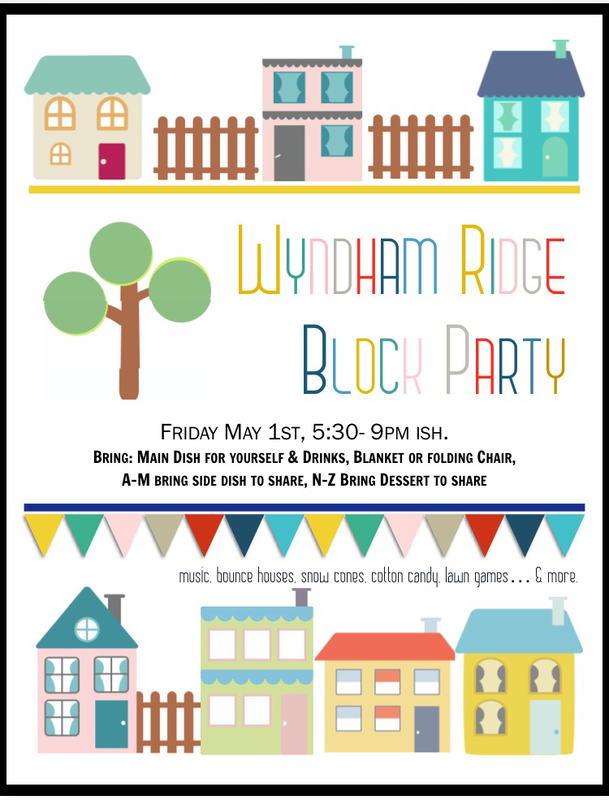 Our 2nd block party. After starting 3 years ago with just a few families, our second year we had around 60 adults and around 40 kids after our first year, when we had around 20 adults. After that, we had about 150 adults and kids. 1. Get Input on a Date & Go With It. Picking a date can be the largest obstacle for some. It’s hard to nail one down because inevitably great people won’t be able to come, whichever date you choose. Put some feelers out there and then just move forward with what works for the majority of people you talk to. 2. Make a Flyer. This is one thing I didn’t want to delegate because I personally enjoy a little graphic design. We distributed ours through our Homeowners Association management company. See if they’ll mail everyone a hard copy versus an email version. I use google image & Picmonkey.com. 3. Create a Sign-Up/ RSVP. For one, this will give you a gauge as to how many people are coming. But also, people are more likely to come to something they’ve committed/ RSVP’d to. We used Sign Up genius which I liked because people could also sign up for which side they were bringing. It also gave me the emails for every person coming so that I could email them a few days out with last minute details.Please comment below if you have something else you prefer! 4. Budget/ Food. My theory is that people like to participate. And we didn’t have a lot of money to pull this thing off. So, we asked people to volunteer- which they did GENEROUSLY. Don’t be afraid to ask people if they’re willing to run with something. If they don’t want to, they can say no. You might be surprised though- a lot of people want to feel involved. We also had everyone bring their own main dish, plus a side or dessert to share. 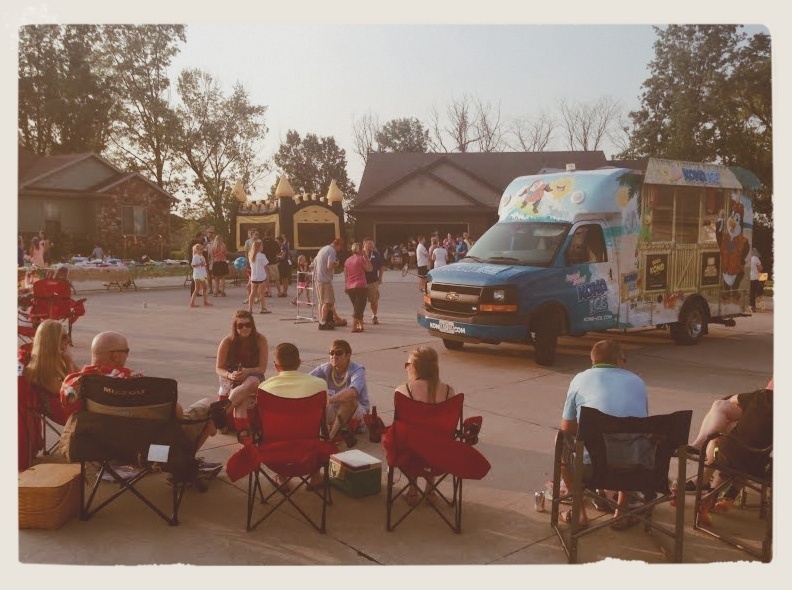 We are considering food trucks for the future, but the downside is that I think that people like the feel of a potluck dinner. We’ve also considered catering the main dish and having people chip in a few bucks. We’ve also considered a shrimp boil, which I’ve done with another group. 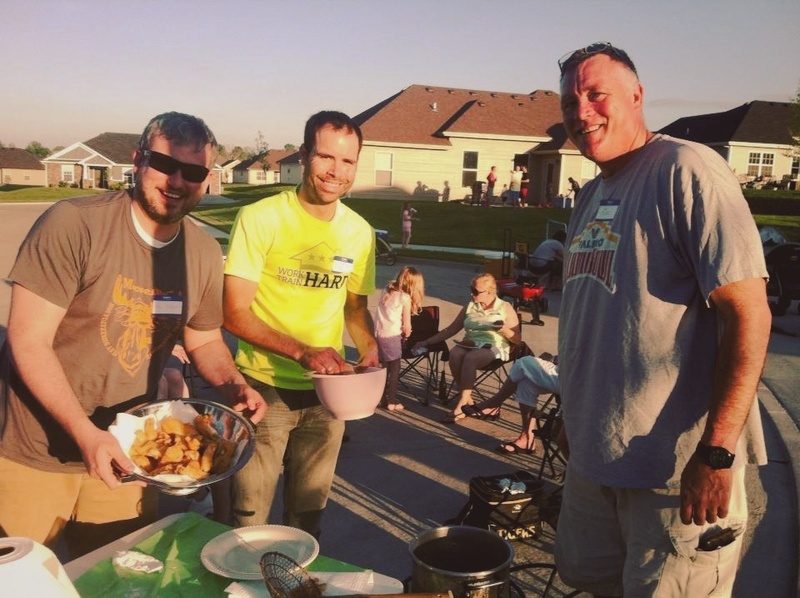 Last year, we did a fish fry, which was a blast. But similar to the shrimp boil, it does make a for some extra work for those working the fryers. Last year’s fish fry. Bingo (right) working the fryers while my husband (left) & our neighbor battered peoples’ fish. 5. A Bounce House is Key. If you have kids in your neighborhood, I can’t emphasize enough what a big hit this is. 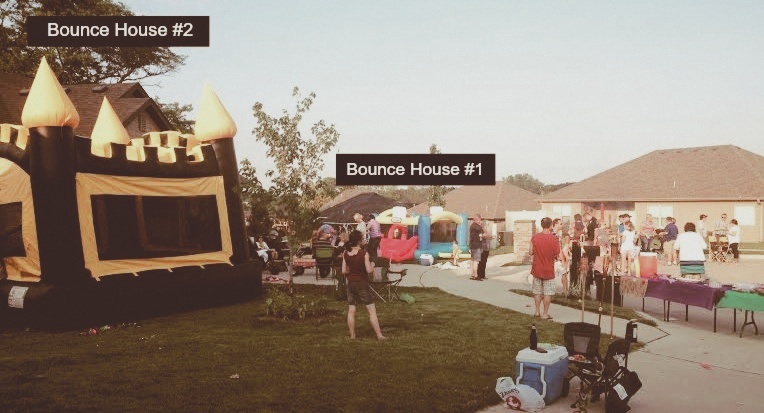 Nowadays, a lot of people own bounce houses because you can pretty much buy one for the same price as renting one (around $200). We actually had TWO this year! 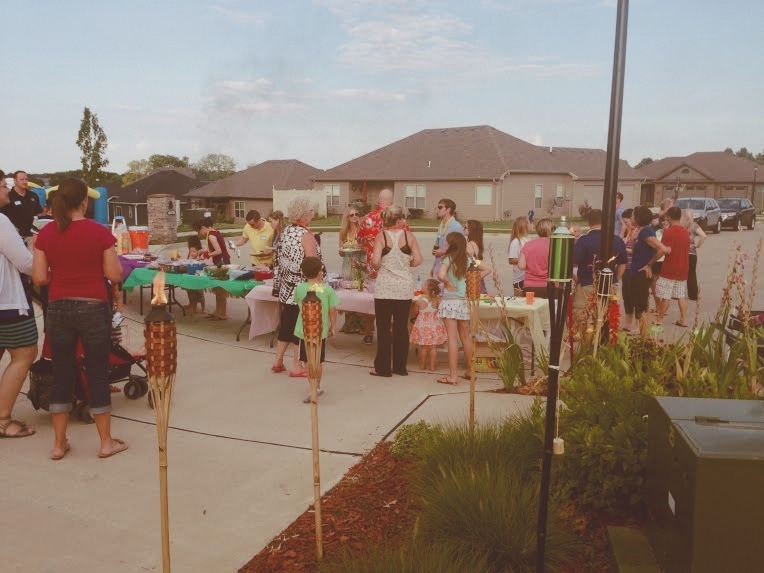 We were fortunate that our next door neighbors were willing to volunteer theirs for the smaller kids… and Century 21 has one you can reserve for free. One neighbor reserved it, picked it up, set it up and returned it. Amazing. Double the bounce houses= double the fun! 6. Greeter’s Table & Name Tags. 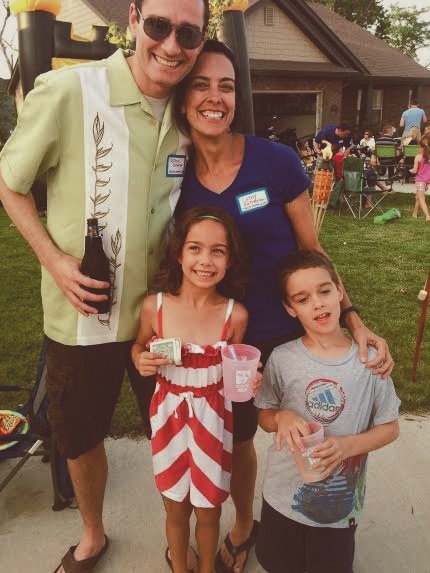 Our first year, we had no one to officially greet people when they walked up, so some people just kind of wandered around. We saw it was hard for people to break into groups/conversations if they didn’t know anyone. This year, we had a welcome table where we could greet each person, give them a name tag, further instructions about the food and encouraged them to introduce themselves to someone new. We also had people write their address under their name so that we could have a general idea of where people lived as we mingled- especially helpful if you found someone just a few doors down! 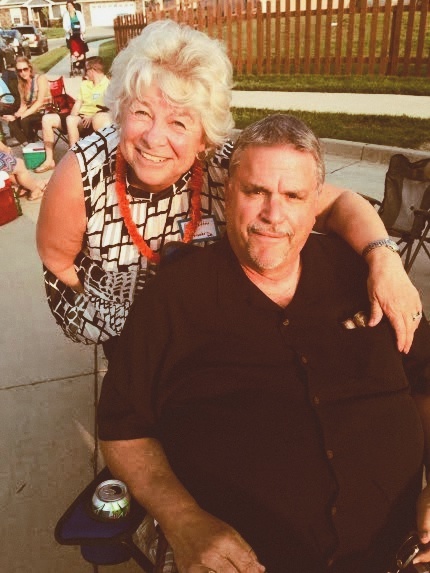 If you are more administratively bent and less of an upfront person, consider asking someone with a more outgoing disposition (even better if they’re already connected in the neighborhood) to be the official greeter at the welcome table. Greeter/Welcome table (left) and food tables. This year’s theme was a luau, so we also gave each guest a lei. 7. Take Pictures. People love to have their picture taken. We tried to get a picture of everyone who came through the line (although I know we missed people) and asked if they’d feel comfortable if we posted the pics to the Neighborhood Facebook group. Hoping this creates a sense of connectedness and belonging as well. If you have your hands too full that night, assign someone else to the Greeter’s station to take pics. We lucked out with beautiful weather. Next year, I will make sure we have a date locked and loaded for May. 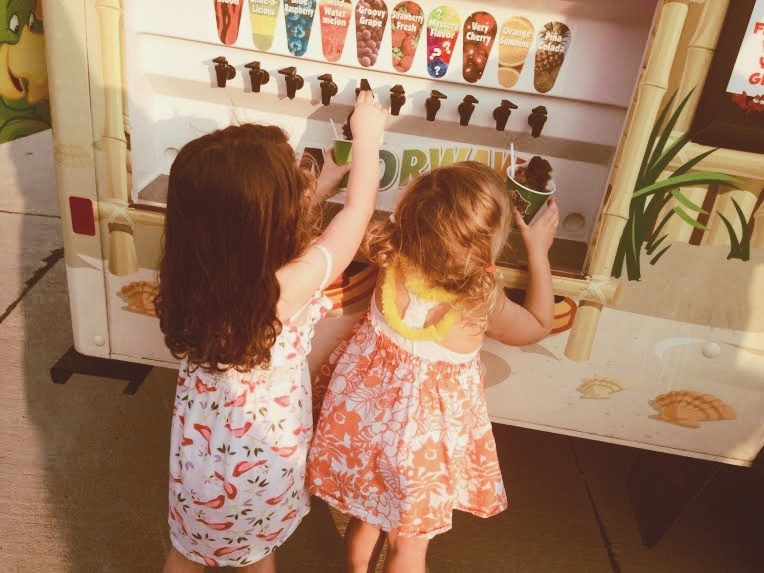 Kona Ice was a huge hit with the kiddos. 8. Have a Bathroom Plan. For the first few years, rather than pay for a porta-potty, we offered our house for those who needed a bathroom, as did our next door neighbors on the culdesak. If you’re coordinating down the street from your home, make sure you ask (don’t assume!) if you can use the bathroom of the nearest house. 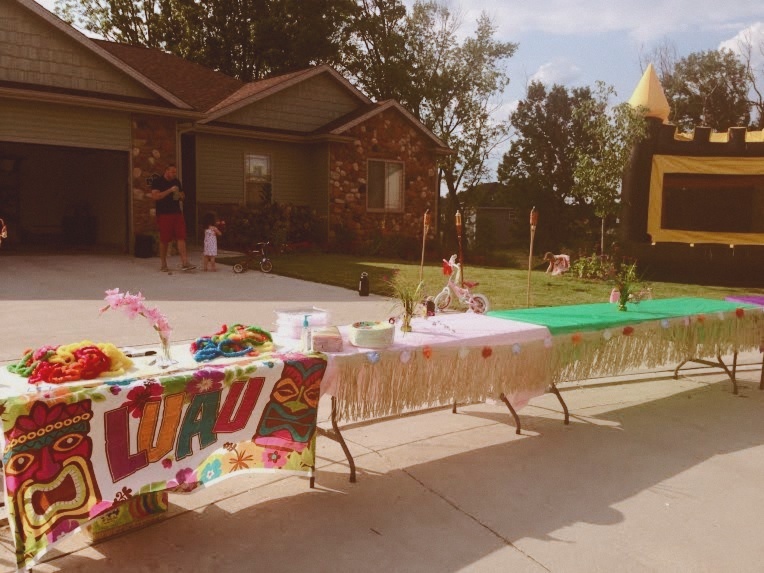 Some may feel uncomfortable with this for a variety of reasons, including if they have babies or small children they need to put to bed before the party ends. In that case, respectfully figure out plan B. Now that it’s grown so big, we’ve decided to get a couple porta potties (the company we’re using is charge $150 for 2 and will deliver them and pick them up the next day). 9. Music. Music is a powerful tool that brings joy & sets people at ease, so don’t let this be an afterthought. If you delegate this, ask someone who will choose fun, familiar songs that are also appropriate for kids if they’re around. Consider making a long playlist on Spotify. Decorations- Tiki Torches are fun to have. If you get some, don’t forget oil and a gas lighter as well. Plasticware & Tablecloths- You’ll need Silverware, Plates, Cups & Napkins. Water & Lemonade- People may bring their own drinks, but it’s nice to have a big cooler (or two) of at least water provided. Make sure your coolers are cleaned out in advance- that can be a last minute pain! Trash- Make sure you have extra large trash bags. Set Up & Clean Up Crew- Always good to have paper towels, masking & scotch tape and scissors on hand too, btw. Also, utilize social media. Our neighborhood has a Facebook group, so I was able to communicate with a core of about 40-50 people. If you don’t have a Facebook group, consider starting one for an easy means of communication. At the end of the night, I heard several people say how connected they felt and how much they already loved the neighborhood. Just by throwing a party, you can literally help people build relationships, feel safer and less isolated in their home. I hope this gives you some vision- as well as some steps- to reach out to your neighbors and make some new friends. Good luck & let me know how it goes! 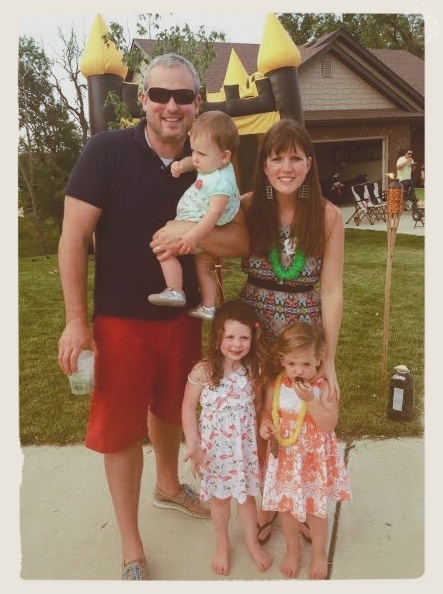 To read my thoughts on some of the why’s behind The Art of Neighboring, read my guest post on the Every Square Inch blog. 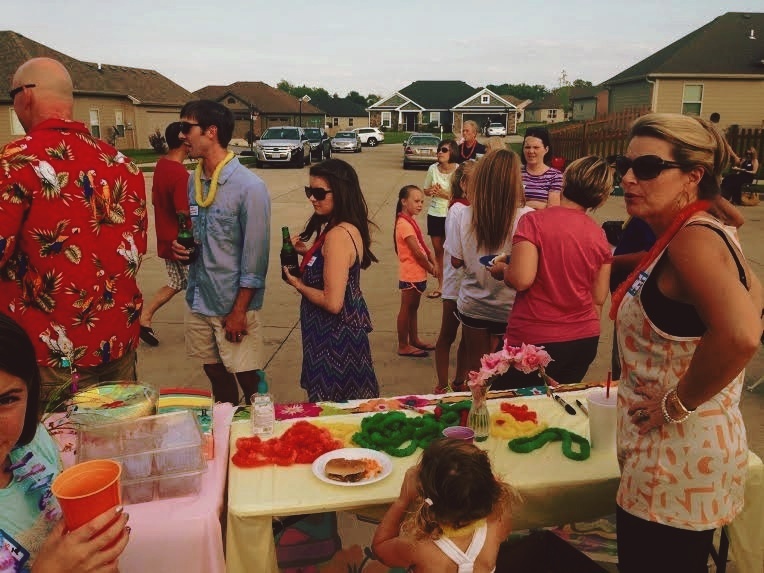 For those of you who went to a Block Party growing up, what’s a fun memory you have? For the 4th of July block party all the kids would ride their bikes (we would decorate them first of course) and have a parade down our street. The roads would be blocked so we could go all around the neighborhood…it was a BLAST!! Those are such fun memories! 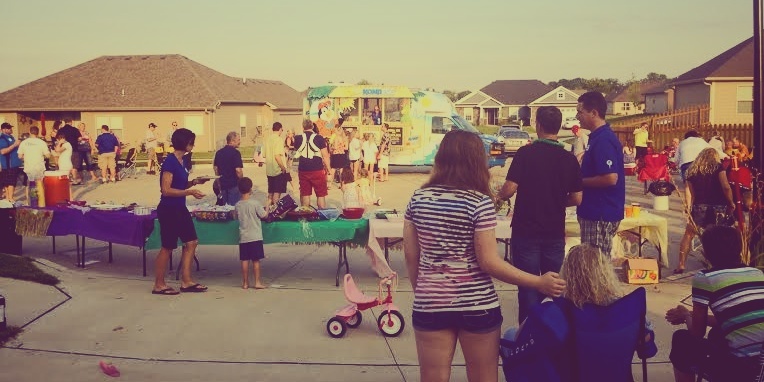 I have a similar early childhood memory from our first house where we decorated bikes on our street for a 4th of July parade- unfortunately we moved and weren’t in a subdivision from that point on. I’m excited for my kids to have fun memories like you do. Great post Elizabeth! Now if you’d only be wiling to come here and organize one for our neighborhood! Bob! Thanks so much! Throwing a block party in southern California for you guys? Yes please. Hey Elizabeth – it’s Cari Myers (now Reddick) from STC and Miami. I stumbled across your blog and LOVE all your ideas. My neighbor and I are planning our first annual block party for this Saturday and are following your recommendations! Everyone seems really excited to get a chance to get together. Hope all is well! Cari! I thought I responded to this, but I guess not. Thank you so much for your comment. How did your block party go??? ?